In a large pot of salted boiling water, cook the broccoli for 2 minutes or until tender. Remove from the water using a slotted spoon and cool in an ice bath. Drain thoroughly. In the same pot of salted boiling water, cook the pasta until al dente. Drain. Meanwhile, in a large bowl, combine the broccoli, tuna, cilantro, pepper flakes and one-quarter of the green onions. Season with salt and pepper. Set aside. In a large skillet over high heat, soften the tomatoes and the remaining green onions in the oil for 5 minutes or until the tomatoes burst. Simmer for 5 minutes or until the sauce thickens. Season with salt and pepper. Stir in the pasta and coat well. Adjust the seasoning. 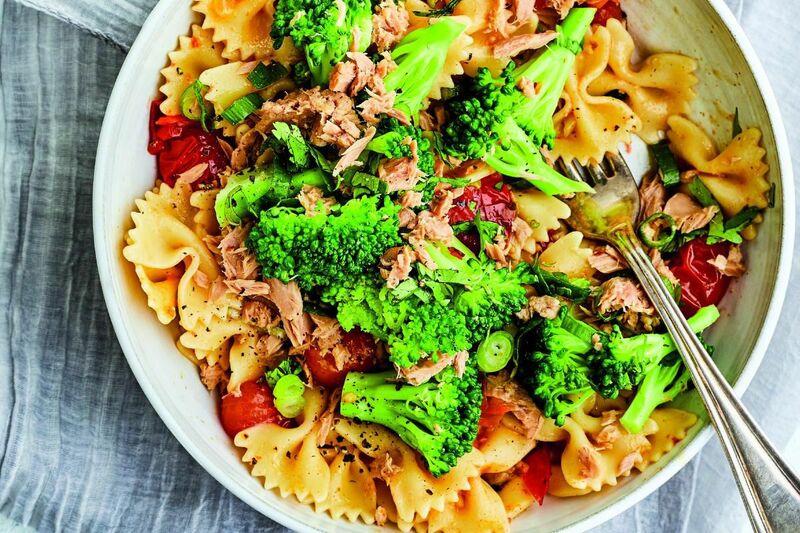 Top with the broccoli and tuna mixture.